New Hawaii Island newspaper? 1916. There are a number of Hawaiians planing a new Hawaiian newspaper for the Island of Hawaii, under the direction of John Kai. This will perhaps be a newspaper that fights against the Board of Supervisors [Papa Lunakiai] and the Chairman [Lunahoomalu]. And there is other word that it will wrestle with the Hoku. That is their business. Ka Hoku o Hawaii, Buke 10, Helu 32, Aoao 2. Ianuari 13, 1916. 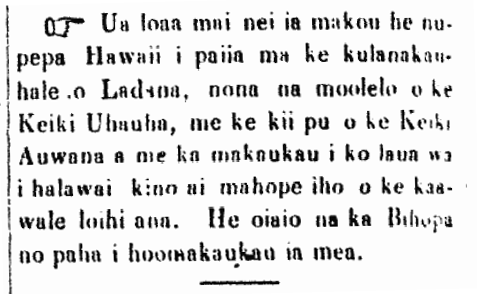 Handwritten newspaper, “Mamalahoa Kanawai,” 1873. Put before us was a handwritten newspaper called “Mamalahoa Kanawai.” Perhaps it will only come out with one issue and it will perish. Or perhaps also it will flourish. Ka Nupepa Kuokoa, Buke XII, Helu 27, Aoao 2. Iulai 5, 1873. Hawaiian newspaper printed in London? 1872. We have come into possession of a Hawaiian newspaper printed in the city of London, in which was the story of the Wasteful Child [Keiki Uhauha], along with an illustration of the Wayward Child [Keiki Auwana], in preparation for their meeting each other in person after a long separation. It is true that it is probably the Bishop that put it together. 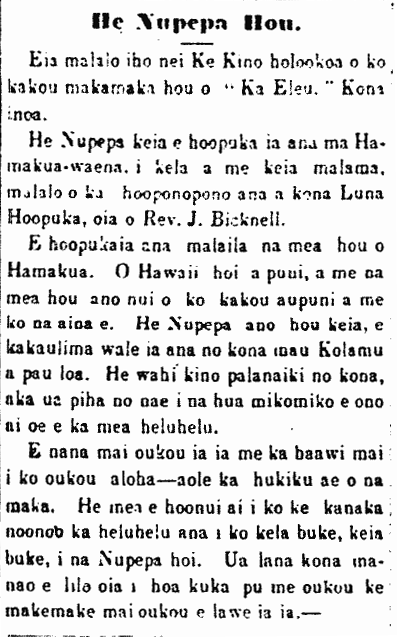 In 1867, Hamakua’s new monthly, “Ka Eleu”. Here below is the entire body of our new companion; “Ka Eleu [The Lively One]” is its name. This is a paper printed monthly in Hamakua Waena, edited by its publisher, who is Rev. J. Bicknell. In it is printed the news of Hamakua, of the entirety of Hawaii, and important news of our nation and of foreign lands. This is a new paper, and all of its columns are but only handwritten. It has a very small body, but it is filled with tasty fruit that you will savor, O Reader. Look to it and give it your aloha—don’t look down upon it. Reading different books as well as newspapers will increase one’s thinking. It hopes to become a companion to talk to, should you decide to subscribe to it. Nupepa Kuokoa, Buke VI, Helu 43, Aoao 4. Okatoba 26, 1867.